Instructions on setting up your school's teachers and students. What is the purpose of a School Admin? Instead of Lab-Aids assigning licenses to individual teachers and students, this process relies on a School Admin that can roster students, teachers, and other staff, then distribute licenses to teachers. In addition, the School Admin also creates “Classes” within your online portal that associate teachers and students accordingly. Most schools should already have a designated person to handle such rostering and provisioning demands for online educational services. Often, this is a curriculum specialist or IT person in a school/district. If this role does not already exist, a person needs to be selected who will handle this responsibility. The School Admin should have access to your school's class rosters via your Student Information System (SIS). They should know which teachers, students, and classes that need access to which content. Password: You should have received an email with your password when you were initially set up. If you don't know your username or password, please let us know ASAP by emailing portals@lab-aids.com. We recommend changing your password upon login by clicking on your account in the upper right corner. You must add classes before rostering teachers or students. Classes provide a way to associate students and teachers in the system. 1. Log in using the school admin account. Click on "Roster", and then click "Class" from the left menu. 2. If you just want to add a few classes, click "Add Class" to add them one-by-one. 3. 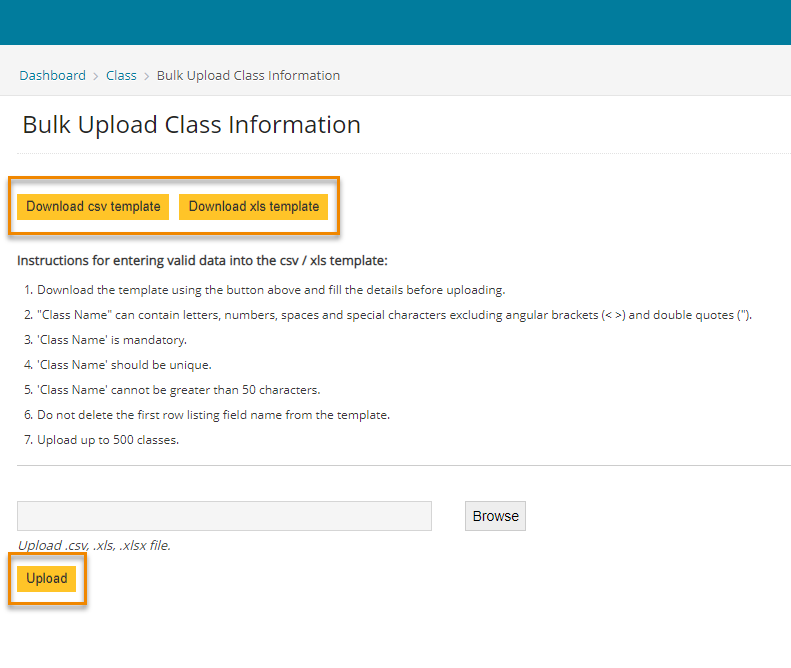 If you have many classes to add and want to upload them using the bulk upload template, click on the "Bulk Upload" button and follow the instructions on the screen. See this document for more information on the data required for bulk uploads. If you choose the Bulk Upload option, you'll need to download the CSV or XLS template of your choice and fill it out according to the instructions on the screen. Then, upload the document on the same "Bulk Upload Class" screen. Be sure to follow the instructions, as they provide important guidelines that will help your upload be successful. 1. Log in using the school admin account. Click on "Roster" and then "Teacher" from the left menu. 2. 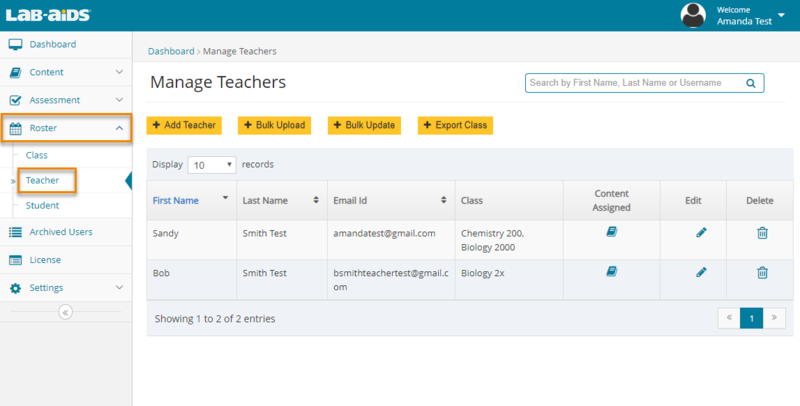 Manual Entry: If you just have a few teachers to add, click "Add Teacher" to add teachers manually. a) Enter first name and last name. c) Enter the password. You can either type in the password or select "Generate" to auto-generate a password. 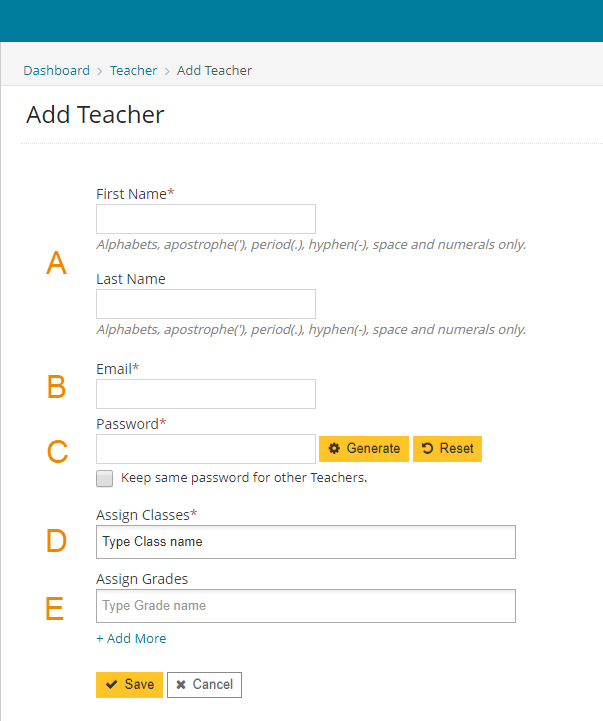 Select the box "Keep same password for other teachers" if you wish to provide the same password to all the other teachers. d) Select class names from the list to assign to the teacher. These class names will already exist because you should have already added them in the previous step. Select multiple classes by holding the CTRL button and clicking each class. e) "Grade" field is optional. We highly recommend leaving it blank. 3. 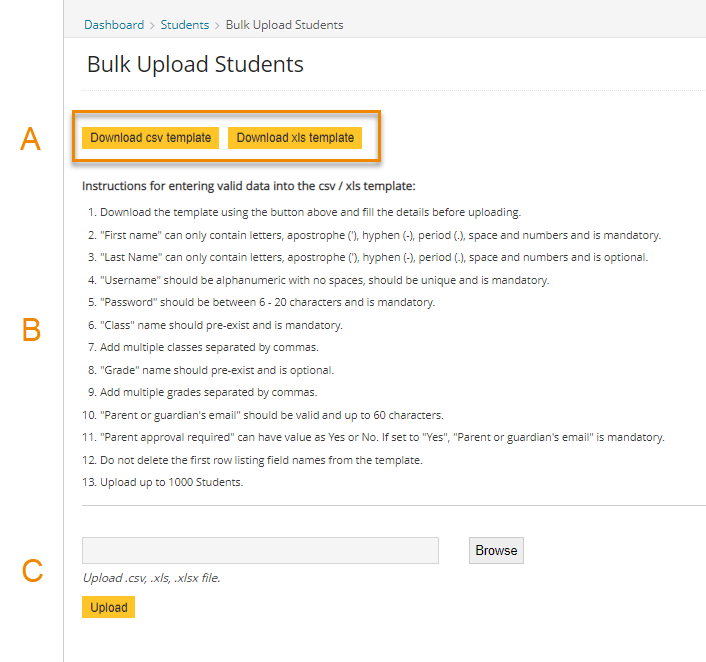 Bulk Upload: If you have many teachers to add and want to upload them using the bulk upload template, click on the "Bulk Upload" button and follow the instructions on the screen. You can refer to this document for more information on the data required for bulk uploads. a) Download the CSV or XLS template of your choice. b) Fill out the template with teacher information according to the instructions on the "Bulk Upload" screen. It's very important to follow these instructions, as they will help you have a successful upload. See below for helpful hints. c) Upload the saved document with bulk teacher information. If you are having trouble uploading documents, please contact portals@lab-aids.com. Include the bulk upload document and the error message you're receiving, and we can help diagnose the issue. Read the "Bulk Upload" instructions closely, as they provide important guidelines that will help you have a successful upload. Class names must be entered exactly as they are spelled in the system. Make sure you have six column headings, even if the error message states five. "Grade" field is optional. We recommended leaving the "grade" column blank, but don't remove the column heading. 1. Log in using the school admin account. Click on "Roster" and then "Student" from the left menu. 2. 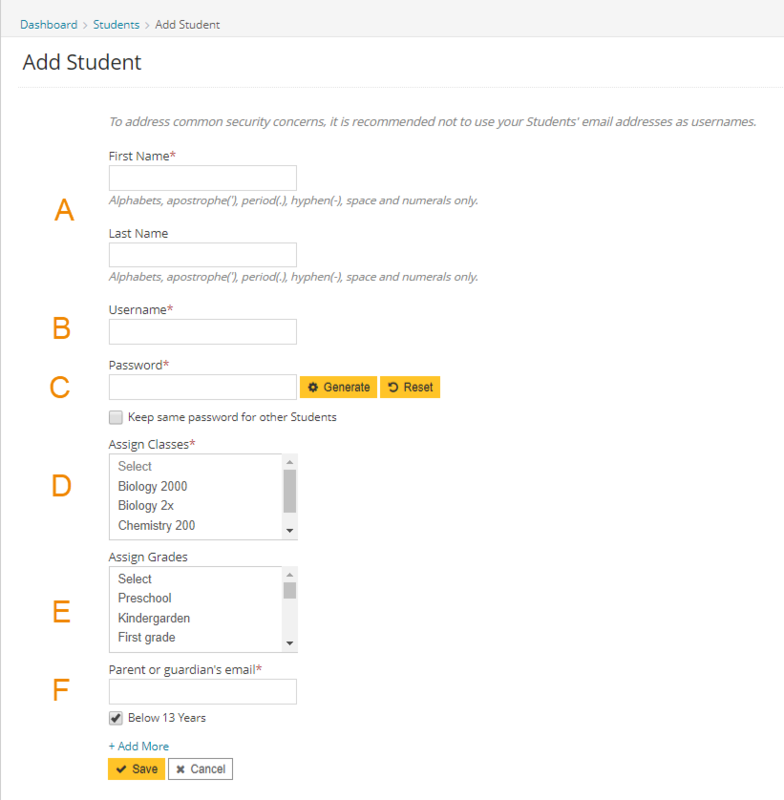 Manual Entry: Although you'll likely want to bulk upload your students, you can still add students manually. For manual entry, click "Add Student" and enter the information into each field. For bulk upload, skip to number 3.
b) Enter username. Username must be unique. It can be an email address, although it doesn't have to be. d) Select class names from the list to assign to your student. Select multiple classes by holding the CTRL button and clicking each class. e) "Grade" is optional. We highly recommend leaving it blank. f) Parent or guardian email / Below 13 years: These are optional fields. These fields exist to help comply with COPPA. If you choose to enter a parent/guardian email, the system will send an email to the parent/guardian email address that the parent/guardian will need to respond to before the student can use the system. If you have another method of complying with COPPA or if you have students over the age of 13, you can uncheck the box for "Below 13 years" and leave the email field blank. Please refer to this document for more detail. 3. Bulk Upload: Click on the "Bulk Upload" button and follow the instructions on the screen. You can refer to this document for more information on the data required for bulk uploads. b) Fill out the template with teacher information according to the instructions on the screen. It's very important to follow these instructions, as they will help you have a successful upload. See below for helpful hints. c) Upload the saved document with bulk student information. 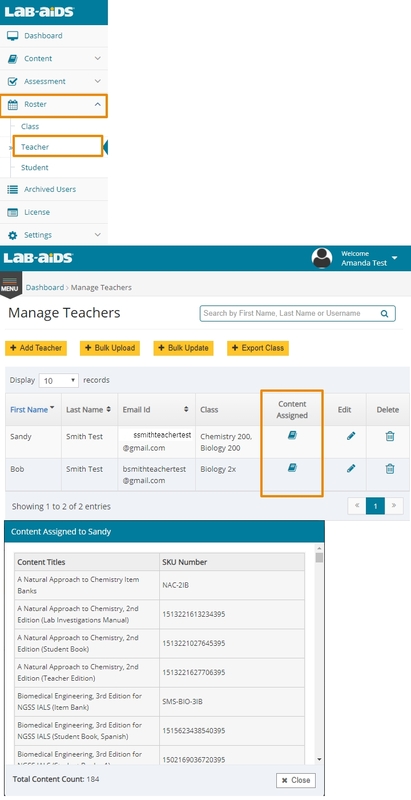 If you are having trouble uploading documents, please contact portals@lab-aids.com. Include the bulk upload document and the error message you're receiving, and we can help diagnose the issue. Class names must be entered exactly are they are spelled in the system. Make sure you have eight columns, even if the error message states seven. 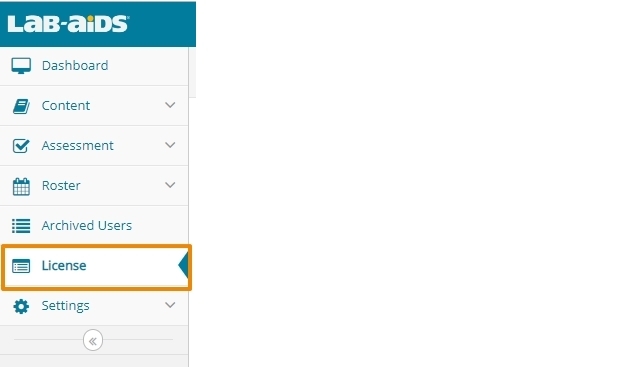 If students are over 13 or if you choose not to use our parental approval feature, leave the column for "Parent or guardian's email" blank, and enter "No" under "Parent approval required". Username may include @ and . as well as the characters in the instructions. *Before assigning licenses to teachers, you'll need to make sure you have already added classes and rostered teachers. **If you have been given a student PO and a teacher PO for the same content, you'll need to assign both POs to your teachers. 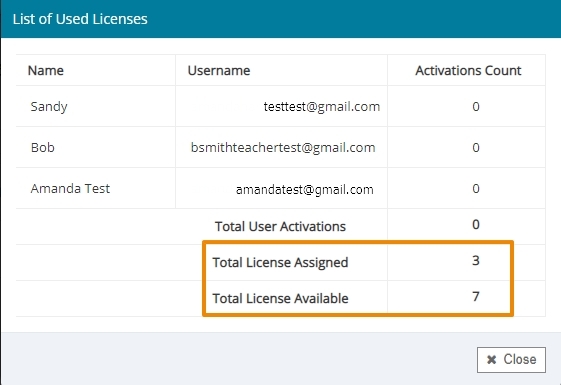 1) After logging into the admin account, select "License" from the left-hand side menu. 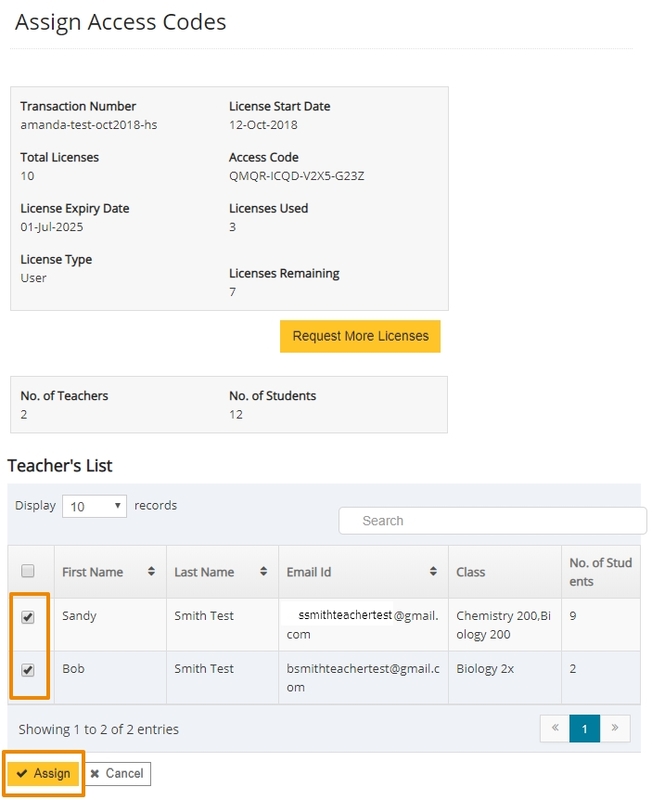 You'll see a list of all POs (sets of licenses) assigned to your school, along with all related PO information. 2) Click the "Assign" icon on the right side of the PO. 3) Select the teachers who need access to the PO, and then click "Assign". Your teachers will now have access to this content, and they will be able to assign content to their students* (see Helpful Hints below). *A) If you have been given a student PO and a teacher PO for the same content, you'll need to assign both POs to your teachers before they can assign content to their students. When the expiration dates of student licenses and teacher licenses differ, we separate out student licenses and teacher licenses into separate POs. If this is the case, both POs need to be assigned to teachers so that teachers can then assign content to their students. The teacher PO usually ends in -01. The student PO usually ends in -02. If you only have one PO for both students and teachers, that is okay. 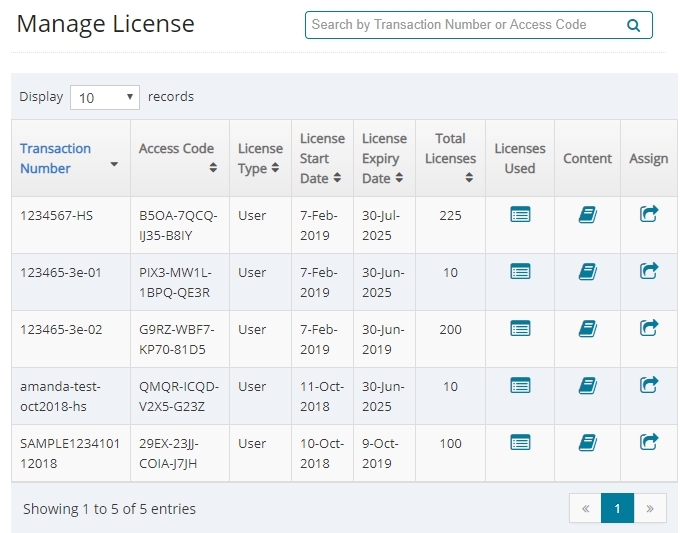 B) How to view licenses used vs. licenses available: From the "Manage License" screen, click on the icon for "Licenses Used" to view Licenses Assigned and Licenses Available. C) You can check to see whether your teachers have been assigned content by going to Roster > Teacher > "Content Assigned". 1. 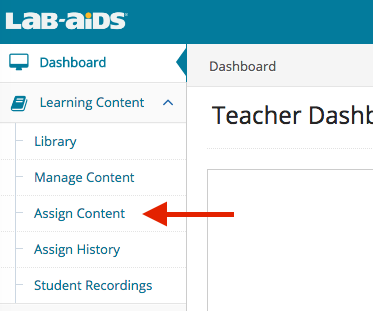 After logging into your teacher account, select Learning Content >> Assign Content from the left-hand side menu. 2. 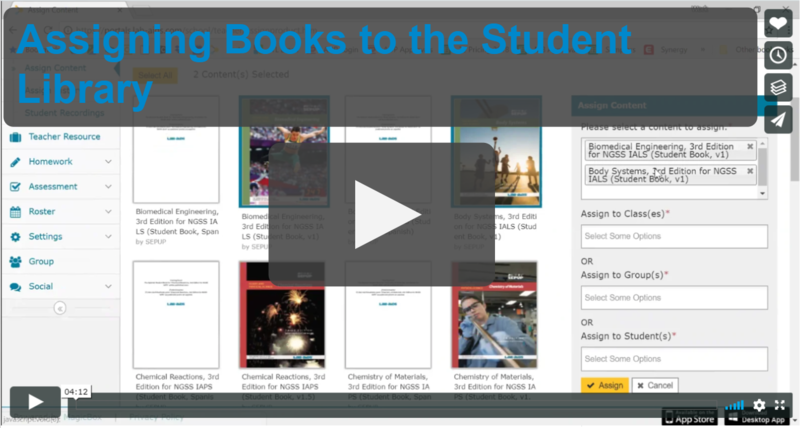 Next, you will see the available Student Books that you can assign to your students, Classes, or Groups. Select the titles of the Student Books you wish to assign by clicking on the these products. 3. 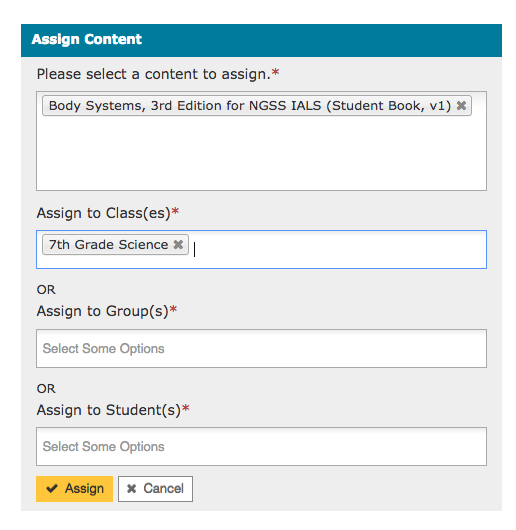 You can assign the Student Books you selected to entire Classes, Groups, or your individual students. Once you have selected the appropriate students, click the Assign button and your students will then have access to these products. *You'll need to assign content to any new students that join the class after content has already been assigned. New students that get added to your existing classes won't automatically be assigned content.